This old photo shows the area where Evelyn Street on the left (out of view) crossed the end of Deptford High St to meet Wellington St (Flagons Row) on the right. Center, slightly right shows the entrance into Old King St which went into Watergate St at the far end. To the left we can see New King St. All this area was demolished to make way for Evelyn St to join up with Creek Road. I suppose around the right hand corner into Wellington St one would now find the Old Post Office which is still there, and across from that corner to the right of Old King St now standsDeptford Central Hall. The Harp of Erin must be in there somewhere as well? Wow, this view really changed in a relatively short time - interesting since street layouts are usually retained even if buildings are demolished. Your right about the street layouts being retained. I cant help but think about the position of the pub The Harp of Erin. When I visited place last year it looks as old as the building in the center of the photo flank either side by the two King Streets. what do you think? My Grandfather was born at 80 Wellington Street. I think I have a picture of almost exactly the same location taken in 1933/4 of him as a boy. The building in the right of your picture is the Duke of Wellington is that right? He has spoken about being bombed in WW2 with 80 lives lost when just one bomb struck a (different) pub. Flagon Row was later called Wellington Street and is now what remains as McMillan Street. All these houses were demolished in 1896 to make way for an extension of Creek Road east to the end of Evelyn Street. By 1933/34 most of the area had changed but I do remember parts of Queen Street, now Lamerton Street still having old buildings upto and after WW11. Can you send me a copy of the photo and I will post it here? I have just come across this site of 'OLD DEPTFORD HISTORY'and being a Deptford boy in the 30s to 60s found it very interesting, I used to live in gilbert house not far from albury street and the pub on the corner of church st had the nick name of 'THE BLUE LIGHT' and when I was a youngster the publican was a big fat man who sat on a stool at the bar. When you say the pub on the corner, Church Street The Blue Light, was this the Kings Head? corner of Albury St.. Church St end. 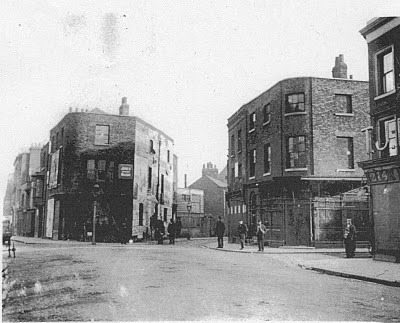 Do you have any old photos of Deptford in particular the Kings Head Pub. I will post photos with any related stories you have. ive just found the site, fantastic memories. I was born at 21 Stanley ST,just off Douglas Way. Does anyone remember the Warick Pub, the bagwash or the rag shop in stanley st. What about the fantastic ice cream at Perrys ! !At the top of Stanley St there was some garages and Acker Bilk used to have his tour van serviced in the early 70s there by an old black guy, well he is still alive and i spoke to him for hours a few weeks ago, hes a bit of old deptford. Who elses mum used to pay off weekly clothes bills in Peekrises ? and what about the toy shop at the top of the high st, Wow, so many memories. I used to go to club and play football for St Pauls with Father Bomford and Father Diamond. I did an interview with Lou who used to run a cafe on Deptford High Street with his sister Josie. He told me that there used to be a place where you could sleep on a rope for 6 pence. The ropes were spread across the room and people used to hang their arms over them and attempt to sleep! Hi Paul, read this! seems the two penny rope hang over was not the only way to get a nights sleep. The four penny coffin (also referred to as a coffin house) is a Victorian term that described one of the first homeless shelters to be created for the people of central London. It was operated by the Salvation Army during the late 19th and early 20th centuries to provide comfort and aid to its destitute clients. The Salvation Army operated other homeless shelters in the area. These shelters charged the clients different amounts depending on the amenities offered. At the low end was a penny sit-up, where a homeless client could get food and shelter from the cold in exchange for a penny. He was allowed to sit on a bench all night, but was not allowed to sleep. For an additional penny, there was the "two penny hangover". It was like a penny sit-up except that a rope was placed in front of the bench. The client was allowed to sleep when he leaned on (or hanged over) the rope during the night. He was not allowed to lie down flat on his back and sleep. The rope was cut at daybreak in order to encourage the clients to wake up early and leave. For four pennies, a homeless client could stay at a coffin house. These rows of "coffins" were the men's sleeping quarters in London's Burne Street hostel. Circa 1900He received food and shelter. Moreover, he was allowed to lie down flat on his back and sleep in a coffin shaped wooden box. A client was given a tarpaulin for covering. What made this unique is that it was the cheapest homeless shelter in London at that time that allowed its clients to lie down on their back and sleep. The Salvation Army also offered shelters that allowed its clients to sleep on a bed for a much higher price. Hence, the coffin house was popular because it offered an economical and midrange solution for homeless clients looking for relief from the cold. Just like wrighties memories my mum used to pay of at Peekries. She always chose clothes too big for us so that they would fit ok by she paid them off. It was quite exciting standing waiting for the parcels to come down. Also who remembers the shops by St Paul's in the High Street one sold offal and my nan used to but pig's heads there to make into brawn. Also there was an italian ice cream shop in Edward Street or the bakers in the High Street where the Blue Peter charity shop is where according to the time of year we would get a penny donut or an ice cream on the way home from school. Does anyone else remember the blacksmiths in the railway arches in Hamilton Place where they shoed horses. My brother and I were often almost late for school watching them. I love old photos. Back then that were the highest buildings in downtown. what about the old showgrounds who remembers them. I remember my Dad taking me to the fairground just under the reilway bridge. The old penny machines and bumper cars. I lived in Grove Street until 1957, then Corston Street. Remember the old Bug Hutch. Used to go there on a Friday night with dad then get faggots and pigs trotters from Henneys I think it was called. I was born in New King Steet in 1928.I enjoy reading the letters especialy the Cattle Market - at the end of our street.Fond memories of the Hight Street well lit up on a Saturday night. The Show Grounds Manzies Pie and Eel Shop also Goddards Pie shop. The Noahs Ark Pub.My Father took me to see the "Rope" where you could sleep!! so much to remember. I have found a relative on the 1871 census living in Gothic Hall. Can't find anything about this building anywhere. It must have been close to Clarence Place on the Broadway. Found this article from the London Gazette 1860. Does it help? on Wednesday the 21st day of March, I860, at Eleven o'Clock in the Forenoon precisely. "William Miller, formerly of the Gothic Hall, Broadway, Deptford, Kent, Coffee and Lodging-house Keeper, and carrying on business as a Chemist and Druggist at No. Licensed Retailer of Beer and Tobacco. Rochester, Kent, Carpenter and Builder, and during part of this period engaged as Hop Assistant. Thanks for the reference. Miller also appears in on Old Bailey Trial as a witness against a would-be burglar. Gothic Hall had a large number of lodgers but I still can't find out if it was a private undertaking or run by a mission, Nor what happened to it. I came from be New Cross end of Deptford but I spent most I of my childhood years 7-10 street raking as my old mum used to call it down Douglas Way& Deptford high street with my old mate Les Mannering. The old bombed out buildings and the soap factory, there was a bit of waste ground in Watson street which backed onto the park we used to let off fireworks and run like ----. In them day's you could only buy them in November not all year round like now. Saturday morning pictures at the cinema on Clifton hill/Newcross road, 6d to get in who remembers that ? ,After that Mum would send me To get her weekend shopping, fresh bread from Johnson's, meat from the butchers in Douglas way almost opposite the eel stall , then over to the Globe store next to David Gregg's (where I met my wife). Poor old Charlie the tramp never hurt a soul, the girls from Gregg's use to make him up a bag of off cuts to help him out. Was the Chip shop in Douglas way called the Dolphin? Hi, my grandad came from Deptford. His name was Thomas Comarty.He was born in 1915 and was the youngest of (I think)13 children. His oldest sister was called Kate (Catherine). My grandads dad worked in the Royal Victualling yard and died when my grandad was a toddler. On his way back to work after going home for his dinner, he choked to death on a bit of potato stuck in his throat. My great aunt Kate could also remember her grandad being let out of the workhouse once a week to visit the family. He would take his pudding which he'd saved to give to his grand children. Another Cromarty (Susannah I think) gave information to the Police about one of the Stratton brothers. That was the first time fingerprints were used as evidence in this country. Although she was a prostitute, she was recorded as being his 'girlfriend'. The family last lived in Abinger Rd, which I believe has gone now. My father George Parrish was born in 9 Lamerton Street in 1918 and our family lived there from the early 19th century up until the mid 1960s. Does anyone remember the "All-IN" wrestling at Deptford Arena on the High Street which took place three times a week on Tuesday, Friday, and Sunday. Bert Assirati from Islington was the British Champion and the biggest star to appear there, along with Max Krauser, Jack Sherry, Jack Pye, etc,etc,..
in the 50s . When we moved to London and remember well the Nissan huts , any pictures ? Not only was there resident's who were of lower class but I read Solicitors, doctors all types of class profession stayed there as well. If you have any factual information on Charlie the tramp aka dog end bill I would be interested to hear. I was brought up in Deptford in the 50s,I remember eating school dinners with the smell of the soap fry making me feel sick.Can anyone remember the soap fry in frank ham street ? Moved to the abinger grove maisonettes too. The caretaker @2 brambling court used to keep the place in very good order. Remember the swings by the tower block, the community centre by dolphin square, and charlies sweet shop. Moved there after they knocked down the houses on warwickshire street and then built new flats renaming the street to warwickshire path. Were there any deaths in this area because me and my family are seeing weird things like black figures. I used to speak to Charlie the tramp as he used to sit at the end of our street, Etta Street. He told me that his house was bombed in the war killing his family and he swore never to live in a house again. I know the police used to puck him up a couple of times a year and clean him up before letting him go back on the streets. He used to sleep in an old car under the bridge at Edward Strret. His brother was the owner of Purdies wet fish shop in Deptford High St. He was a really kind man who had time for children, I was about 8 and he also loved animals. I think her maiden name was Reb White as I found the following marriage to Robert Benjamin Dobbins the son of William and Elizabeth Dobbins.